Football is big in this state. Boys start playing the game as young as 4 or 5 years of age, when their helmets are bigger than they are. I became interested in football from an early age, probably because it was the only thing on military television when we lived in Germany. When we returned to Texas, my parents enrolled my brother in Pop Warner football, when he was eight. I was dragged to his practices, and when I didn't have a book to read, I watched the players slam into each other without regard for their personal safety. They were being boys, and that is what boys do. I can remember the sound of eggs cracking; that was how it sounded when helmets struck together just so. My love of football stuck around for awhile. I read books about the sport, and even subscribed to Sports Illustrated for a while to stay current. I was a faithful viewer of the NFL. I was watching the night that Joe Theisman broke his leg on Monday Night Football, and I sat through the 300 repeat viewings of the incident without throwing up like my roommate. Although I never got into college football much, I did manage to attend an icy Texas A&M vs. the University of Texas game one Thanksgiving. Those fans kept me warm with their chanting and screaming, but I really didn't get the hype. But my love of football has cooled over the years. I've always had soccer in the back of my mind. When you mention football in other countries, that's the mental image people get. Foosball, futbol...means soccer. In Germany, soccer was king if you weren't living on a military post. Germans love them some soccer, and I can remember posters and magazine covers of the local stars, even if I usually couldn't read the headlines. Soccer is not for the faint of heart, certainly. Soccer doesn't allow for timeouts, or commercial breaks, or coaching from the sidelines. Once you're on the field, that's it, until half time 45 minutes later. The larger, heavier players are not usually as successful as the lighter, more limber players, like Lionel Messi. A soccer player has to be able to think on his feet as well as run, as there aren't really specific plays. Just about everything happens in the moment, based on decisions made by the player with the ball. He(or she) must quickly make calculations and predictions based upon the other players on the field, ball trajectory, and the placement of other team members. No wonder studies have shown soccer players to have higher IQ scores than other athletes! 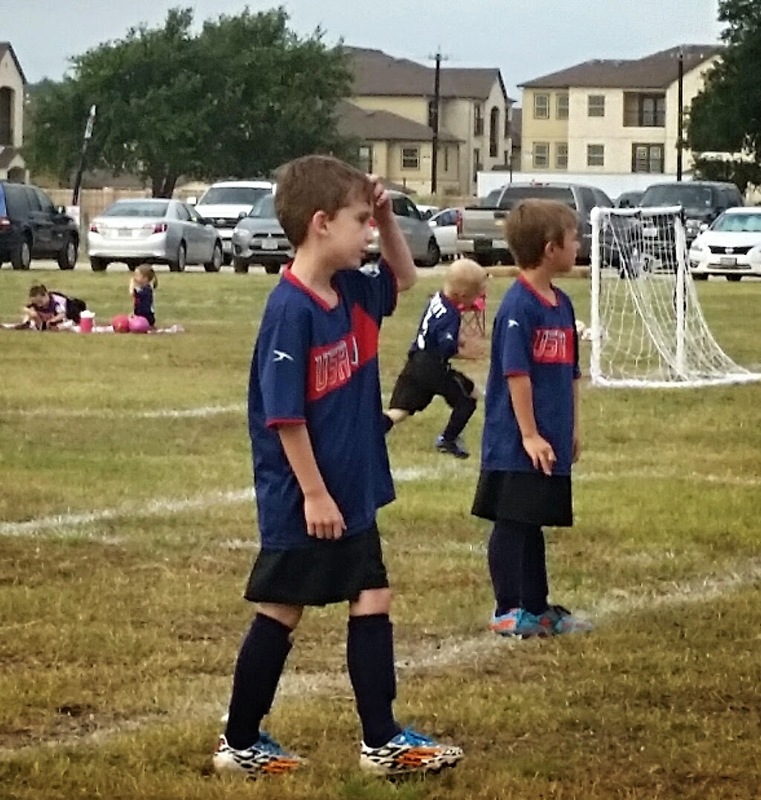 So now my own boy plays soccer. He's never been interested in any other sport. Besides, soccer was a natural choice for an active child like mine. Zane runs all the time, so why not throw a ball in the mix and point him at a goal? He's actually not too bad at the sport, and he loves it. His skills improve every day. He's not only learning about the game, but he is also learning about working as a team, following the rules, and other life skills. He doesn't have any padding on him, like they do in American football, but boys fall down a lot. They're boys. There are 600 soccer balls all over my house, because Zane likes to run around with a soccer ball in front of him. The entire family watched the World Cup this year, and that's what we will be doing in four years. We attend soccer games even when Zane isn't playing; his cousins play soccer as well. My husband, brother, and my father all coached soccer at one time or another, so they have plenty to talk about at family gatherings. Soccer has become a family thing. My son may decide to play American football one day, when he is older. This is Texas, and American football is king. If he does want to play that sport, I'll try to be okay with that decision. Right now, he loves him some soccer. And so do I.
Mamakat had an extra prompt that caught my eye: write a post inspired by the word football. Thank you, Mamakat!